Be the first to share your favorite memory, photo or story of Vickie. This memorial page is dedicated for family, friends and future generations to celebrate the life of their loved one. 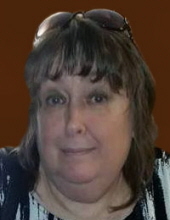 ELWOOD, IN – Vickie D. (Carey) Hull-Ashley, 63, passed away on Monday, July 23, 2018 at her residence following a sudden illness. She was born on December 6, 1954 in Anderson to Melvin and Betty (Tempest) Carey. She has lived in Elwood for the past 7 years. Vickie was a graduate of Alexandria-Monroe High School-Class of 1973. She had worked at the Anderson Meijer store. More recently she worked for Sony in Fishers, retiring on disability in 2010 after 10 plus years of employment. She enjoyed soap operas, reading, shopping and her pets. The time she spent with her family was most precious to her. Services honoring Vickie’s life and legacy will take place at 7 pm on Thursday in the Owens Funeral Home, 412 North Harrison Street, Alexandria. Rev. Courtley Granger will officiate. Cremation will follow the services. Friends may call at the funeral home after 4 pm on Thursday prior to the services. Memorial contributions are suggested to the Madison County Humane Society through the funeral home. To send flowers or a remembrance gift to the family of Vickie D. (Carey) Hull-Ashley, please visit our Tribute Store. "Email Address" would like to share the life celebration of Vickie D. (Carey) Hull-Ashley. Click on the "link" to go to share a favorite memory or leave a condolence message for the family.